Veppam Poo Rasam is a classic dish of Tamil Nadu. Generally prepared during the Tamil New Year. 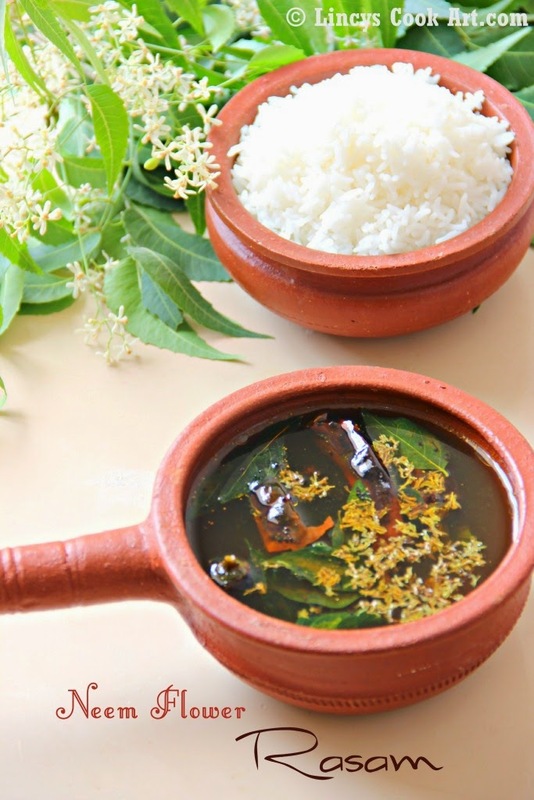 It is a traditional rasam with all the goodness of the neem flower. Dont think that this rasam will be bitter. If you consume with in 2 hours you wont feel the bitterness at all. If you consume a day after you will feel mild bitterness but it is always less bitter than bitter gourd preparations. Tolerable bitterness that is very very mild. Simple and easy to prepare rasam with limited ingredients. Will not spoil for a day even if kept in room temperature as it is prepared with tamarind base. Adding neem flower once in a while to our diet is good for health. Ghee gives a nice flavour and taste to the rasam and blocks the bitterness. Heat half a teaspoon of ghee in a pan and roast the Dried Neem flowers till light golden brown colour. Soak tamarind and extract the juice. Heat a teaspoon of oil with half a teaspoon of ghee and add mustard seeds when it starts to splutter. Add the toor dhal, urad dhal, dried red chilli, curry leaves and fry till the colour of the oil and dhal turns to golden. Add Asafetida in that oil and immediately add the tamarind juice, turmeric powder and 2-3 cups of water. Balance the taste with the addition of Jaggery and salt. Allow to cook the rasam in low flame till it gets frothy on top. Before it starts to boil switch off the gas and add the neem flowers lightly crushed with hand. what a healthy looking rasam... its a new one for me... looks yum! One of my favorite & healthy too !!! In this part of the world, its not at all neem tree, will try when back home visiting. Looks fantastic and lovely pictures as always! healthy rasam and neat presetation!!! veppam poo rasam looks delicious lovely click. Looks tasty and delicious ....... Love it! looks very tasty and nice clicks. I sure found out what can be done with the leaves. I know how healthy it will be and into rasam, yum yum!!! Its been a while i had this rasam, fantastic dish. I'm a big fan of rasam as comfort food for me..Lovely clicks dear..